Televue2X BIG Barlow - 2"
TheTeleVue 2X BIG Barlowwas designed for 2" eyepieces for maximum light gathering ability. Optically corrected for use with telescopes having focal ratios down to f/4. Twice the magnifying power and parfocal for Televue eyepieces. Fully threaded to accept 48mm filters and non-marring brass clamp ring with captive lock-screw. TeleVue 2X BIG Barlow Lensincorporates multi-coated, high index glass for great contrast and sharp images. Can be placed ahead of a 2" diagonal for added magnification. Adapter included for use with 1.25" eyepieces! Televue 2X BIG Barlow - 2"
Are you looking for a high quality barlow lens to maintain the great eye relief of your occulars while doubling the magnification? Then the Televue 2X BIG Barlow may be right for you. 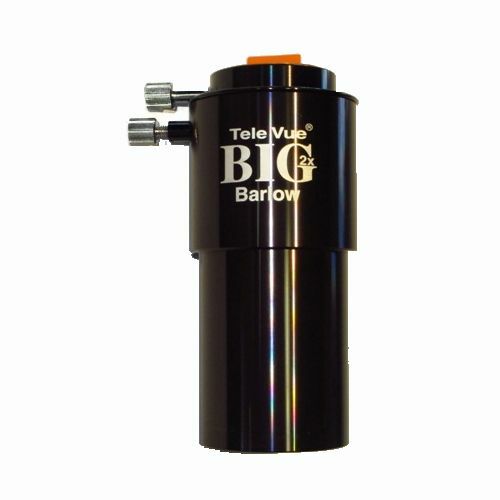 The Televue 2x Big Barlow is for your 2" eyepieces and is parfocal for TeleVue eyepieces as well. But that's not all, The Tele Vue Big Balow also comes standard with a 1.25" adapter so no eyepiece in your collection is left out. For eyeglass wearers, the Big Barlow is perfect for doubling the power while retaining the eye-relief of 2" Televue eyepieces such as the 55mm Plossl, 35mm and 27mm Panoptics (requires use of Panoptics Barlow Interface) and 20mm Nagler Type 2. The TeleVue 2X BIG Barlow is also threaded for 48mm filters and has a captive lock-screw. The brass clamp rings hold 2" eyepieces (or the supplied 1-1/4" adapter) snugly in place...a nice design upgrade! At only 4.5" long, the BIG Barlow can be used in most 2" diagonals or placed in the focuser in before the star diagonal for additional magnification. While this isn't possible with all refractors, the 2" focuser on TeleVue models require an extension tube to achieve focus. When used in this manner, the magnification increases to 3.3X. TeleVue BIG barlow weighs 15 ounces and measures 4.5" long. Using the Big Barlow with 27mm and 35mm Panoptic eyepieces requires an optionalTelevue Big Barlow Panoptic Interface [TE-EPO-INT](sold under the "Accessories" tab) to maintain eye relief, avoid vignetting, and improve the field edge performance.